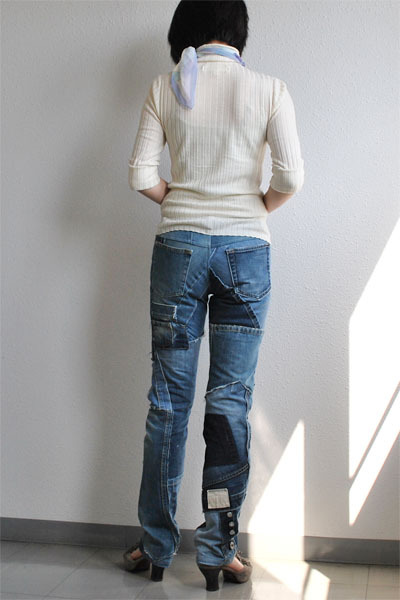 Having been inspired by a beautiful pair of designers jean pants, which was a clever patchwork of various jean pieces, I sewed my new pair by upcycling my family's worn-out pairs. The whole process of making them was so much fun! I drafted my first ever pattern for *real* clothes too. I feel like writing about my latest creation simple and short today, probably because I've had too much fun (you may call it "struggle") with it and currently have no energy for being creative any more. I had an extraordinarily long thought about where to put those pieces, but I couldn't find the right answer before finishing it. 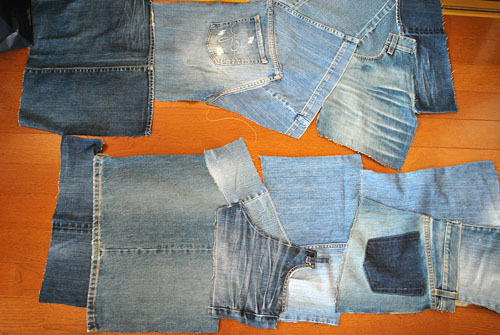 IS THERE THE RIGHT WAY TO PLACE THE CHOPPED CLOTHES ON A NEW PAIR OF JEAN PANTS, ANYWAY? These are two fronts to be. and a self drafted pattern. Have a fun with your sewing! My best friend Chigu is a professional illustrator and of course she sews (that's why we came to know each other, needless to say). 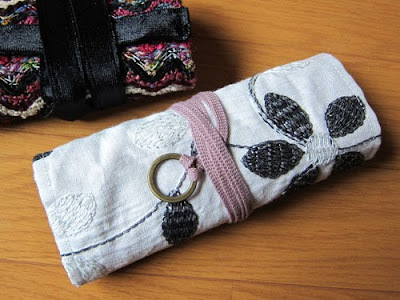 She loved the idea of the accessory carrying sachets, and immediately after finding them in my first giveaway project, she said she made THREE of them for herself. Let's check out pictures she sent to me.Hmmm, looks pretty, aren't they. She is such an artist! 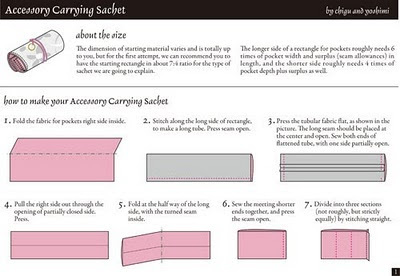 Lovely readers, I'm so excited to tell you this, she did not only sew three of them for herself, but she also made an illustrated tutorial of her version of accessory carrying sachets for you (and for me). So I did put some explanatory notes on it. The only thing we'd like to ask you is not to distribute nor treat this tutorial as a work of yours. 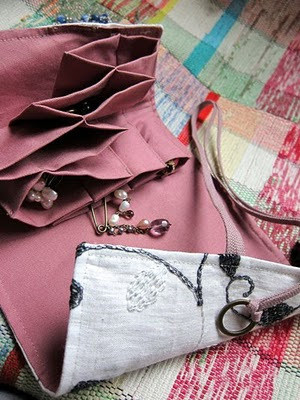 If you also kindly mention our tutorial as a reference for your own sachets, we'd be very glad! *chigu owns a sewing blog in Japanese. Check out her creations here! 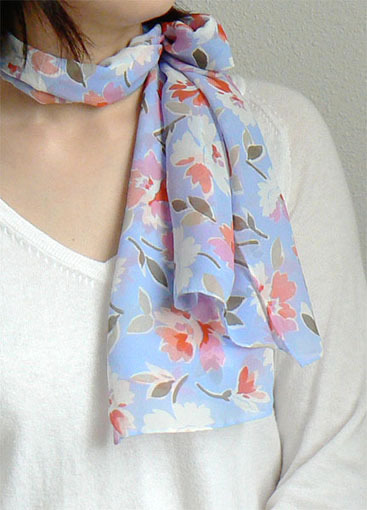 In my last fabric shopping, I bought a flowerly rayon georgette and some other fabrics. 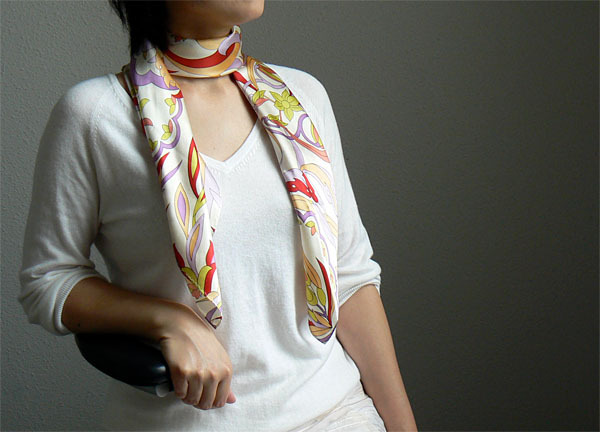 The rayon fabric was (and still is) 140cm wide and 120cm long. I could make a blouse or a skirt from it but I..... made it a scarf. Technically, I didn't have any stitch on it nor did anything, but it was called fabric yesterday, and is now a scarf today, because I made it so. Don't you think it's lovely on the neck, rather than being a mumsy blouse! To save my reputation from being too lazy, I show you that I sometime stitch my handmade scarves. I finally sewed this dress!! I have a long story for this dress. As I'm not good at explaining things short&clear, I try to focus on making it clear today. I saw this beautiful dress made by Ms Erica Bunker some time ago. Since then I've longed to sew my one from the same pattern. I asked my lovely friend Lindsay to get me KWIK SEW 3489 on our sewing goodies swapping last year and she was so kind to grant my wish. A month ago, I finally found a fabric which seemed so right for the pattern, but I knew it was surely one of least good choices for my color complexion. I deceived myself to buy it by telling myself "It's going to be a muslin, it's not going to be wearable anyway" three times and took it home, because I loved it too much. I sewed it, in the right size according to the sizing chart on the envelope. I told myself "Look at it! You knew this was going to happen." I still loved the fabric. I re-cut almost all parts from the ripped scraps. I made it almost 3 size smaller. I re-sewed the dress. It was OK this time. I love this dress. I'd wear it. 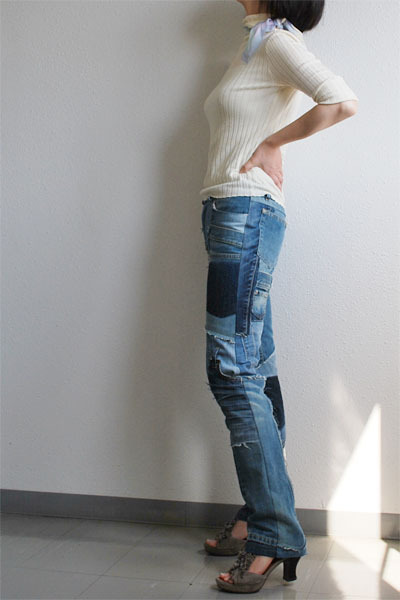 I'd feel very happy in it. I decide to ignore the color problem until I find I actually look horrible in this dress. I may not find myself that bad. It may not happen. The dress is lovely anyway. Misses' fitted wrap dresses have waist seam, flared skirt with shaped front edge, V-neckline, bust darts, and self-fabric ties. 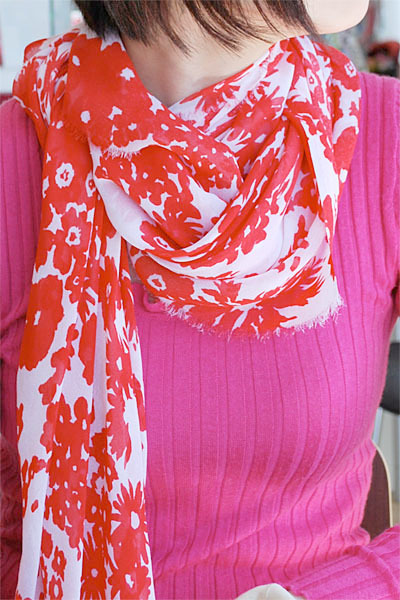 View A ties at the side and has collar and full length sleeves. View B has wrap around ties that tie in front, and very short sleeves. I chose collar and sleeves from view A, and tie from view B. According to the size chart, I chose S size. However, I found it way too bigger than I expected on my first attempt. I needed to sew it again to make it much smaller. 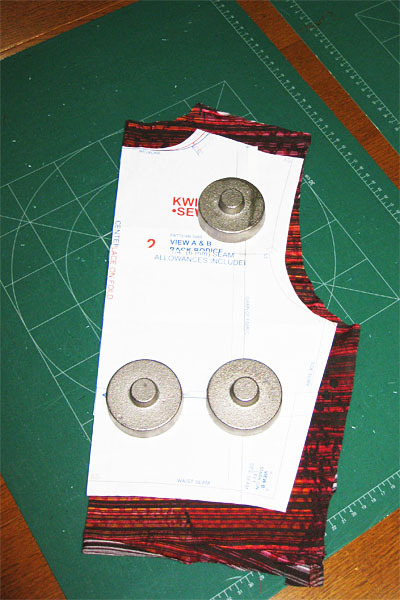 Amazingly, I could re-cut all pieces from the first run, except front bodice parts. 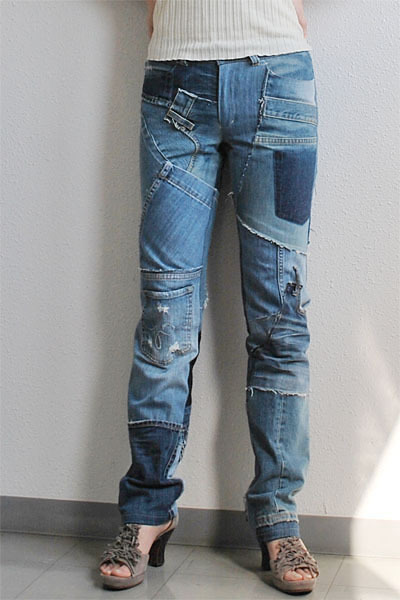 The first one was that big, comparing to the re-sewn one which fit right in the end. Yes, pretty much, after adjusting the size, besides the changes I made to it. Yes. I barely needed to read the text, because the pictures were excellent. I like the style of the dress, without a doubt. However, I liked the pattern much more if I didn't need to find it very roomy after my first attempt. I am not particularly fond of this rounded hem of the front skirts, but it was easy to alter thus I don't count it as a dislike. Very soft polyester jersey with slightest PU blend. I modified the skirts to have a straightened front instead of the original rounded hem. I widened the ribbons and adopted the closure of View B, because I wanted to avoid the elastic casting in the back waist of View A. I shortened the sleeves and added cuffs also. 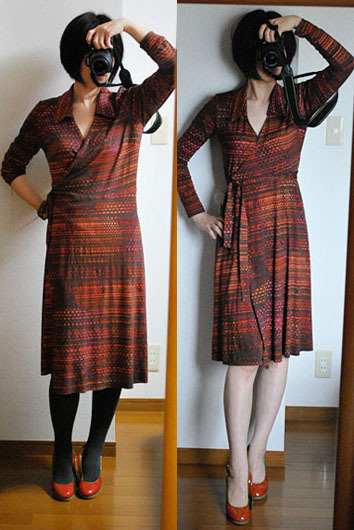 For better fitting, I shortened the length of the dress by 10cm in total, and took width quite a lot (~12cm). I felt that it was almost re-drafting the pattern. I'm quite sure that the biggest reason of my sizing problem was that my fabric was soft and 2-way stretch. Besides, I still feel this pattern is made very roomy, as some of members already mentioned. I just didn't expect it this big when a moderately soft&stretchy fabric was used. Although I needed to sew it twice to get one dress that fit well, I'm quite happy with the result. I also got a complement from my husband, which is VERY rare to happen. I think this dress looks very pretty, and it is surely comfortable!